Welcome back to another brand-spanking new episode of Saturday Night Movie Sleepovers! 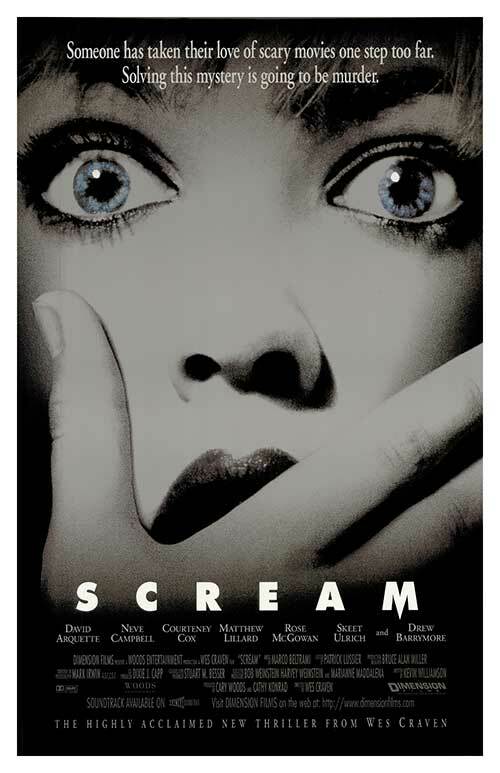 This week J. Blake and Dion Baia are heading back to high school and chatting about a genre classic (though it seems like it was out only yesterday), reliving senior year as they dissect the Wes Craven horror film Scream, from 1996! The boys talk about the era in which this movie was released, discussing the popular idea that Scream revitalized a dying horror genre. They chat about other films of the 1990s that are similar in tone or that are as ‘meta;’ even bringing up the little known underground movie There’s Nothing Out There from 1991, which has some interesting similarities. So sit back and make sure you have your caller ID on, as Dion and Blake swing back to 1996, in this all new, exciting and hilarious edition of Saturday Night Movie Sleepovers! As discussed in the podcast, check more out on the little known horror film There’s Nothing Out There 1991, which bares similarities to Scream. Take a look at this extensive Biography Channel documentary on Scream, entitled Scream: The Inside Story. Check out the bloopers and outtakes from Scream! Hello again and welcome back to another all new episode of Saturday Night Movie Sleepovers! This week Dion Baia and J. Blake are talking another absolute cult classic film that turns 30 this week. 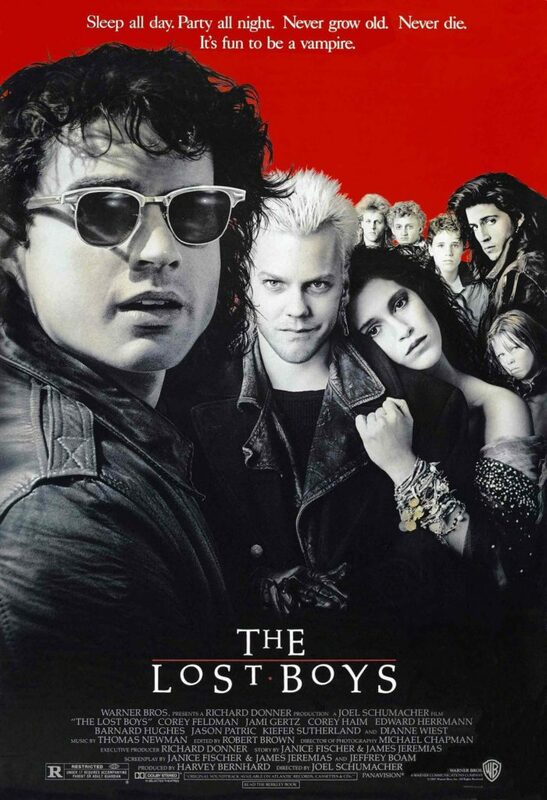 A movie about beach boardwalks, teen angst, and of course vampires, Joel Schumacher‘s The Lost Boys from 1987. The boys fondly reminisce about the era The Lost Boys came out within, and how the concept of teenage vampires was a relatively new idea for audiences. Blake and Dion discuss the vampire lore and the ‘classical’ representation these characters had in cinema, and how this film kind of turned that traditional idea on end. They talk about the obvious connections to novelist J.M. Barrie‘s story Peter Pan, as well as the other cultural influences peppered in the story, such as the reoccurring presence of rock icon Jim Morrison and the symbolism invoked, which goes to the greater themes layered within. They discuss the family dynamics in the story, be it the Emerson family’s or the Lost Boys gang themselves. The lads go into the Corey connection, and the relationship between Haim and Feldman that all started with this movie. 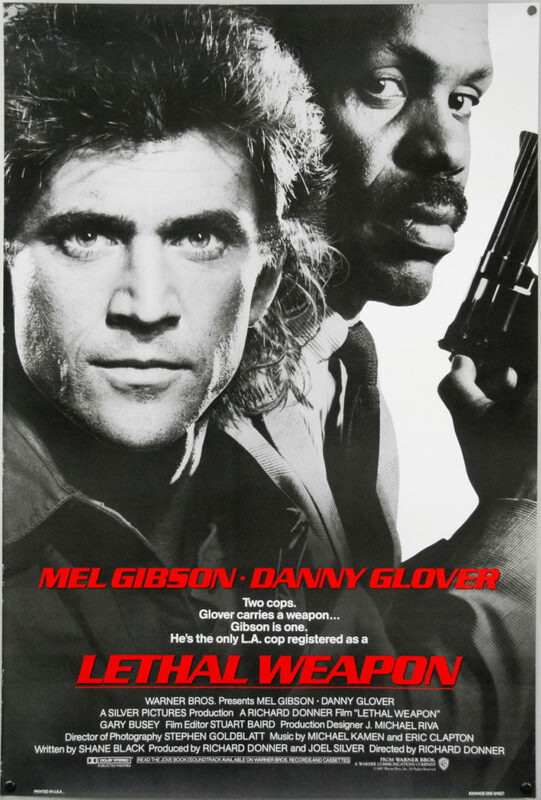 They compare this film to the novelization, and interject some of the subplots and scenes that were discarded in the final cut of the 1987 movie. And they also chat about the sexual tension between the main characters in the story, and ponder the question: who is really attracted to who here? So, how monumental was The Lost Boys’ soundtrack when it came out? Did director Joel Schumacher maybe put himself a little bit into young Corey Haim‘s character? What’s Blake‘s Billy Wirth story? How about Dion‘s Jason Patric encounter? Well it’s about time that you sharpen those wooden stakes, gather as much Holy Water as you can find, and above all, don’t invite any strangers into your house because an all new edition of Saturday Night Movie Sleepovers is coming your way! (* The two stories referred to in the podcast that predate Bram Stoker‘s 1897 Dracula, were the 1819 short story entitled The Vampyre by John William Polidori, and the 1872 lesbian vampire novella Carmilla, by Joseph Sheridan Le Fanu– both in public domain and available online free to read. Check out the original trailer for The Lost Boys! Watch the deleted scenes, here! And check out more deleted scenes from the film, here! Take a look at Corey Haim and Feldman talking about The Lost Boys! Have a look at the 2004 The Lost Boys 17 year old Retrospective! Welcome to a new SNMS feature that we are affectionately referring to as Saturday Night Movie Guestovers, where an esteemed guest comes over and joins in on the movie sleepover fun! Suffering from Halloween horror withdraw, this week J. Blake invites a good friend of the SNMS podcast, writer/podcaster/musician extraordinaire Mike Vanderbilt (@MikeVanderbilt), to discuss a mid-1980s horror film that Mike, in particular, holds near and dear to his heart, 1985’s Fright Night—written & directed by the great Tom Holland and starring the late Roddy McDowall. After a brief introduction of Mike to the SNMS listeners and a discussion about writer/director Tom Holland’s career before Fright Night (as well as a bit of swapping stories about their own personal interactions with the horror movie living legend), the boys make their way through the beloved vampire classic, discussing the strength of its cast of actors and what they brought to the plot and their characters during the film’s extended rehearsal period. The guys also revel in the film’s numerous practical special effects, examine the state of horror and classic movie monsters at the time of Fright Night’s release, discuss the film’s original intended ending, its sequel as well as its remake, its fan-favorite soundtrack, the tie-in comic book series and much much more! Is this film actually the start of both the 1980s vampire boom and the “meta” horror film? Were all 80s teenage boys’ bedrooms exactly the same? Do vampires really eat apples? Are the film’s vampiric villain and his loyal manservant the “Odd Couple” of the 80s? Do they have thin crust pizza in Chicago? Was Marvel’s casting of Tom Holland as the new Spider-Man a bold choice? These are just some of the important questions J. Blake and special guest Mike Vanderbilt try to answer in this giant-sized premiere of Saturday Night Movie Guestovers! As always the podcast is also available on iTunes, Stitcher and most other podcast apps and sites. Check out Icons of Fright’s pirate commentaries, featuring cast & crew, for Fright Night and other films by CLICKING HERE! As mentioned in this episode, you can read Mike Vanderbilt’s interview with Fright Night writer/director Tom Holland by CLICKING HERE! 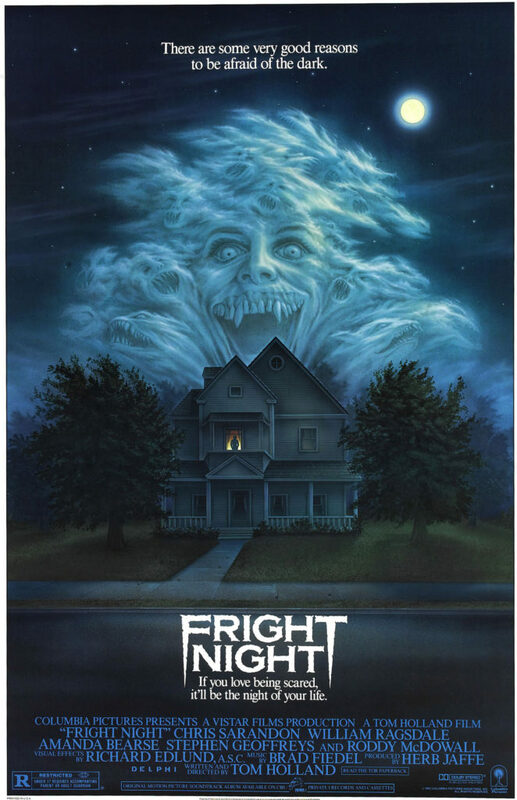 Also, you can read Mike Vanderbilt’s interview with Fright Night music supervisor David Chackler by CLICKING HERE! CLICK HERE to see the trailer for the documentary that the guys mention in this episode, You’re So Cool, Brewster! The Story of Fright Night. Dion Baia and J. Blake are back for another must-listen to edition of Saturday Night Movie Sleepovers! The dog days of summer are wrapping up for the boys in the mean streets of the asphalt jungle, and they had the perfect film to cover at the end of August. 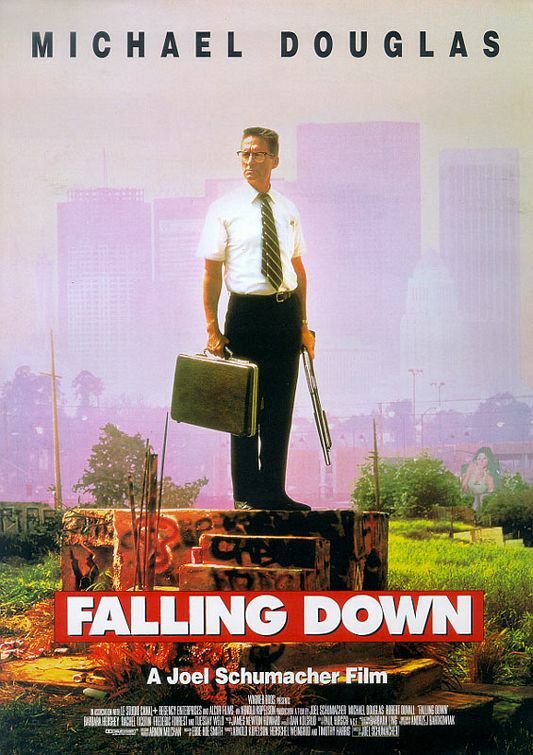 This week they take on an urban classic, something near and dear to a generation of film goers, Joel Schumacher‘s Falling Down, starring Michael Douglas as William D-Fens Foster, from 1993. * The David Hasselhoff TV movie Dion periodically references, is in fact called Terror at London Bridge, from 1985. Check out the original trailer for Falling Down. Now here’s an interesting review circa 1993 by Siskel & Ebert. For alittle extra reading, have a look at this pretty thought-provoking thread on Reddit, as fans analyze Falling Down. Take a look at Michael Douglas from the mid 90’s discussing the film with Jimmy Carter. Have a look at another interview from the era of Michael Douglas discussing his role as D-Feds in Falling Down. And here’s Barbara Hershey talking about Falling Down. Here’s a pretty cool mashup music video using Falling Down footage edited to the Iron Maiden song Man On The Edge, which was written as an homage to the original film. For week 4 of SNMS’ epic October Halloween Month of Horror, J. Blake takes the show on the road and does a totally impromptu special Sunday Night Movie Sleepover “Side-Cast” from the nation’s capitol with a cherished old friend, former classmate and fellow sleepover & horror movie enthusiast, Dave…covering one of their all-time favorite 80s horror classics, Silver Bullet (1985). In this first all new and original edition of SNMS’ “Side-Casts,” Blake calls on Dave’s love and knowledge of Stephen King to help examine this seldom mentioned King penned masterpiece. They discuss King as an author, Cycle of the Werewolf, (the novelette the film is based on) and King’s original screenplay. They discuss how the film is, at its core, really a beautifully executed family drama and marvel at the performances of Gary Busey and the late Corey Haim. They talk about composer Jay Chattaway and the film’s musical score. They explore the werewolf legend as metaphor. Blake tells the bone-chilling story about the first time he ever saw this movie and while under the influence of perhaps one growler of beer too many, the guys get a little deep. Did Stephen King mean for some the dialogue to be a “tongue in cheek?” How does this film’s take on the werewolf transformation really work? Are we, as an audience, supposed know who the werewolf is before Janie does and are his intentions actually good? How loose is “The Buse” in this movie and why do Blake and Dave love this movie so darn much? Try your best not to “make lemonade in your pants,” because all these questions and more are answered in this special Halloween edition of SNMS’ Side-Casts! Check out the original trailer! Here’s a link to the printing of the film’s screenplay Blake and Dave talk about during the podcast. Here’s a compilation of all of Silver Bullet’s werewolf attacks, by Gorey Bits on youtube. Take a listen to Jay Chattway’s fantastic score! Listen to SNMS on Player FM!